A journal is a book for recording words and images.........it can contain records of travel, recipes, gardening, family events, ideas, memories and much more. Keeping a journal is a very rewarding process, it can, however be a challenge to maintain. A journal will take on its own personality over time. A visual journal is much more than a diary. It can contain words, photos, notes, drawings, collage, newspaper and magazine cuttings, stamps, letters, found objects and much more. Many people receive or make beautiful journals, only to find themselves unable to use them because they “don’t want to spoil them”. 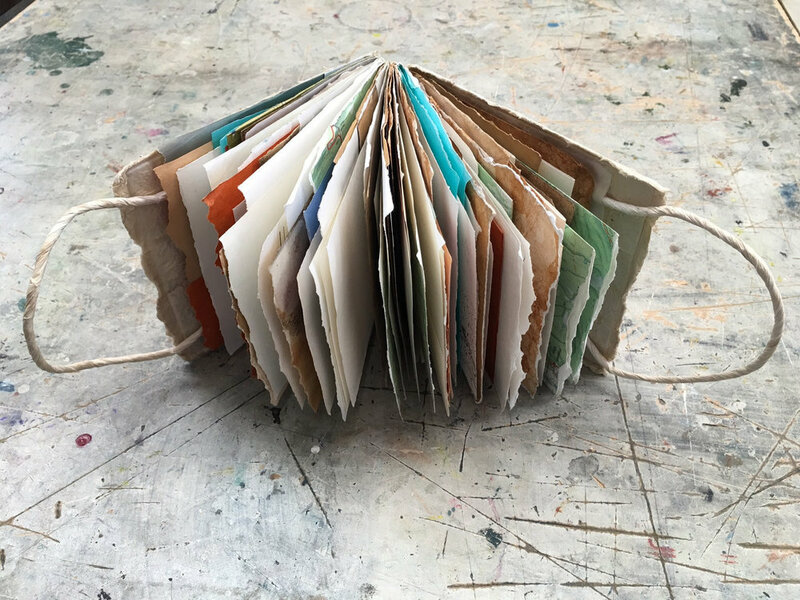 In this workshop we shall make a ‘feral’ journal from a variety of papers that are not precious and therefore, more likely to be used. Ways to treat and manipulate pages and covers will be considered, eg folds, pleats, pockets, windows, handles etc etc. Journals will be sewn with a double needle Coptic stitch, which gives attractive lines of chains across the spine. Each participant will produce one or two highly individual personal journals. You may, of course choose to make a journal with beautiful plain paper. Notebook, pen, pencils, ruler (metal or perspex), eraser. There will be waxed linen thread supplied for a small fee. Stuff to put in your journal: anything that appeals. A selection of different papers, all weights, textured, printed, patterned, plain, eg. photocopies, brown paper, shopping bags, printers' samples, envelopes, wrapping paper, tissue paper, cartridge, Oriental, special papers, hand-made paper, prints, maps, calendars, cards, old drawings or artwork etc. etc. Several large sheets (56 x 76cm) of water colour or printmaking paper up to 200gsm.